Cleaning tack is one of those chores that make the whole business of horse-owning so time-consuming. On some days, when I’ve had to ride in the rain, I’ve spent an hour stripping and cleaning sodden tack in return for half-an-hour’s riding. Still, I don’t actually mind doing it – I find it strangely therapeutic and satisfying, a bit like tackling a huge pile of ironing. Even if you don’t like cleaning tack, it’s vital to take proper care of your equipment – I know someone who never cleaned her tack in 10 years of owning it, and then acted surprised when her reins snapped on a cross-country course. If you really hate it that much, consider buying a webbing bridle that can be thrown in the washing machine, and a synthetic saddle that can be sponged clean easily. Tack is very expensive, and cleaning keeps it supple and comfortable for your horse. It also gives you an opportunity to check for any rubbed areas or worn stitching, and get them mended. 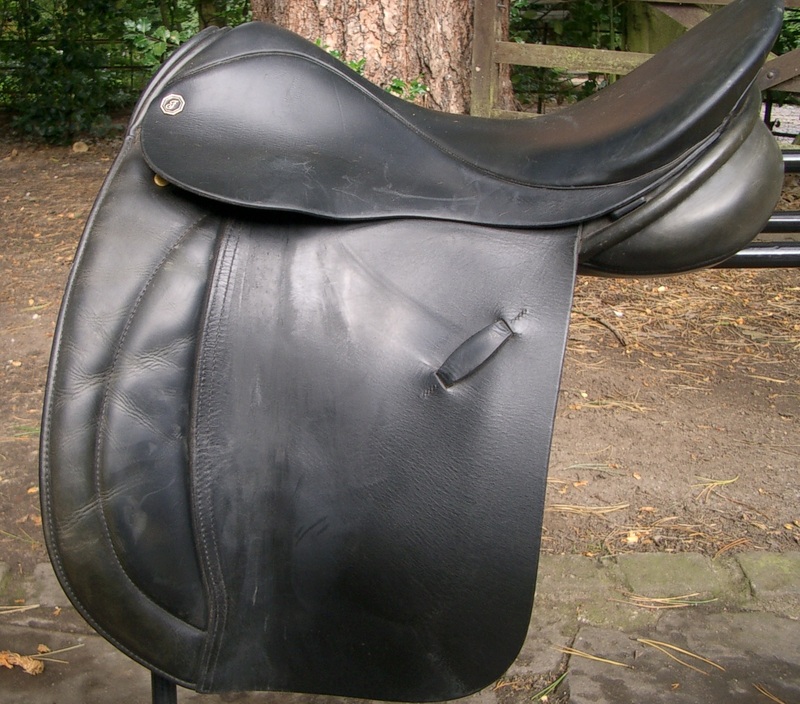 Every so often, give your tack a quick wipe over with glycerine saddle soap, especially if it’s got wet during a ride, and at least every couple weeks strip it down and clean it properly. My disgusting, filthy tack, ready for some TLC. Step 1 – Fill a bucket with luke-warm water. Take care not to have the water too hot; this can damage the leather and made it hard and dull looking. 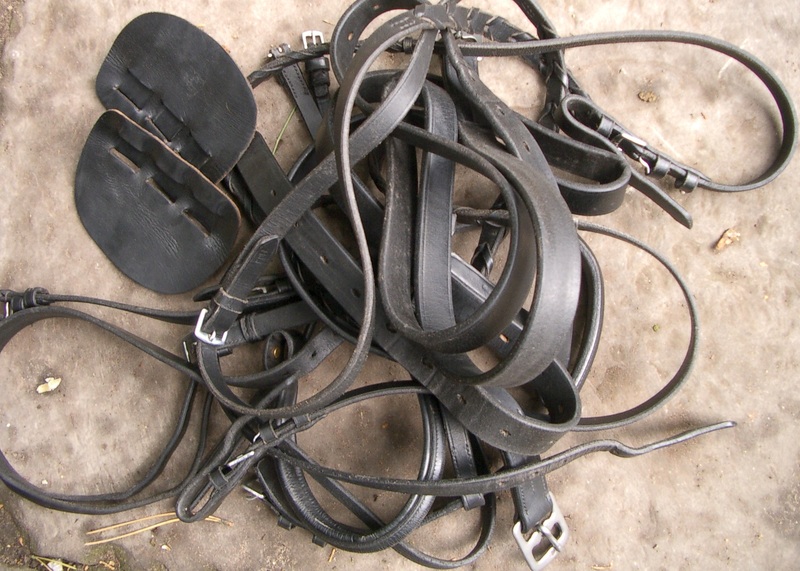 Step 2 – Start by stripping the bridle down. 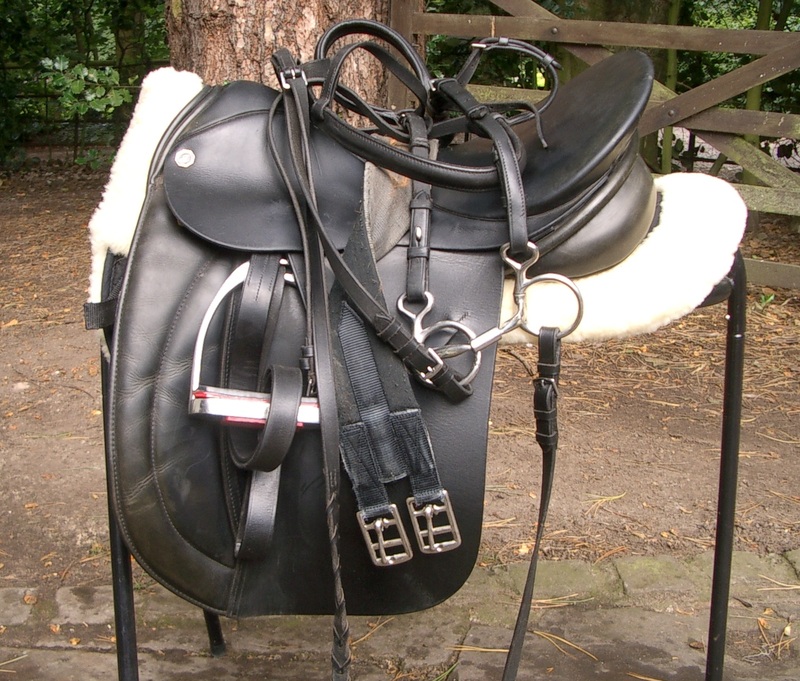 Undo all the buckles – remove the browband, headpiece, noseband, reins and both cheekpieces. If you have stud billet fastenings, undo them by pushing on the place where the strap loops over, then pulling the stud through the slit. Try to remember which holes the straps were done up on originally. Bridle taken to pieces, ready for cleaning. Step 3 – Now strip the saddle. Remove the numnah, girth, buckle guards, stirrups and leathers. The numnah and webbing girth can be washed in the washing machine according to the care label – try to get as much hair off as possible with a curry comb first so as not to block the machine filter. Alternatively, you can buy special wash bags – like this one, £10 from Robinsons – as this will prevent bunging up the filter, and save you from having to wear hairy shirts for weeks. Tip – put an old sock over the girth buckles at each end to prevent them from damaging the machine. A leather girth can be cleaned with the rest of the leatherwork. My saddle stripped down – now you can see how dirty it is! Step 4 – Put your bit and stirrups into the bucket of water to soak. Periodically, you should take the stirrup treads out of the stirrups and wash them separately, as stirrups are prone to rusting under the treads. Tip – put bits and stirrups (minus the treads) in the dishwasher to make them come up sparkling clean. Step 5 – Now dip your sponge into the water, and squeeze it out as dry as you can. A overly wet sponge will damage the leather and cause it to become dull. Clean each bit of leather separately, rubbing to remove any mud or grease. Inspect the underneath of your saddle flaps. You may find little bobbles of grease clinging there, these are known as jockeys, and require some serious elbow grease to remove them! Tip – if it’s really caked on, try using a scouring pad and a tiny blob of washing up liquid. Step 6 – Once the leather is clean, it’s time to condition it. If you have solid saddle soap (tin or bar), it needs to be slightly dampened. The best thing to do (really) is spit on it (ever wondered where the expression spit and polish came from?). Saliva is slightly viscous, which will give the soap the right consistency. It shouldn’t be too wet, and if the soap lathers up it is too wet and may damage the leather. Rub the soap into all the leather, using a circular motion on large areas like saddle flaps. Give high wear areas like girth straps, and anywhere where the leather folds, a double dose of soap as it’s very important these areas remain supple. Step 7 – Using the cloth, wipe any stray soap off areas like buckles and stirrup bars. If you’ve got any saddle soap in the buckle holes, poke it out with something like a cocktail stick. Now retrieve your stirrups and bit and clean them with the sponge before drying thoroughly with the towel. Step 8 – Now it all needs putting back together. Don’t forget to check that the bit is in the right way round, and everything is back on the correct holes. Tip – Try to remember to change your stirrup leathers round every time you clean your tack, as the one on the side that you mount on will stretch faster than the other. Lovely and clean, for about five minutes. Every six months or so, apply some conditioning oil such as Flexalan – this is also great for breaking in new tack, and rescuing oil leather that hasn’t been oiled for years. 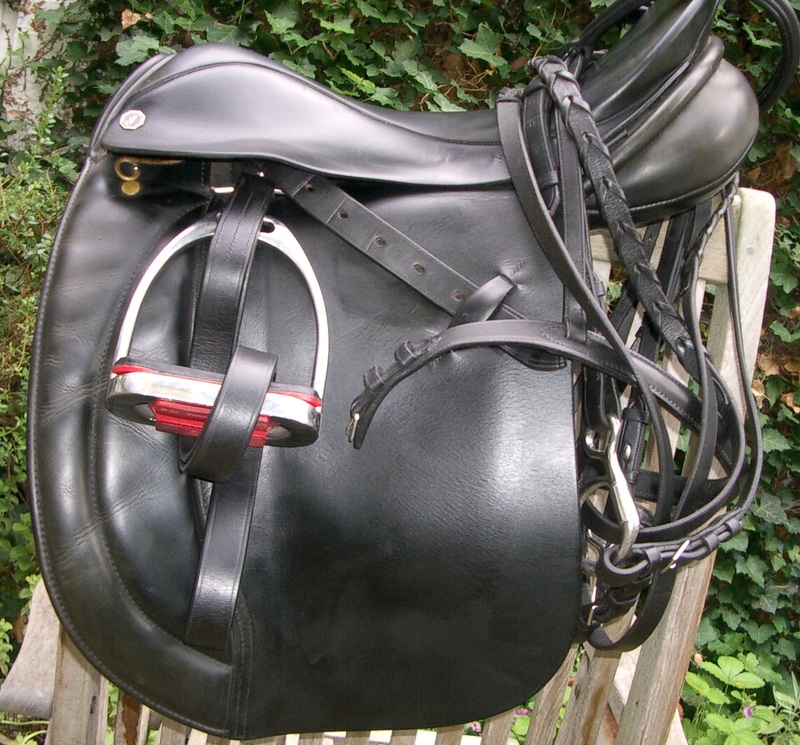 Well-kept tack shouldn’t need oiling too often, as the leather will go a bit flabby and be prone to stretching. And that’s it! Until the next time you get wet, or have a muddy ride or……hah! Don’t you just love horses?